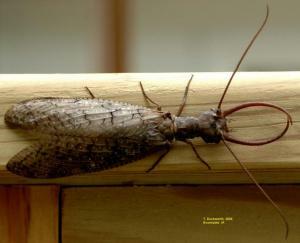 The dobsonfly (Corydalus, spp., Neuroptera: Corydalidae) is one of the largest aquatic insects in North America. Adults measure two to four inches from the front of the head to the wing tips. They are soft-bodied and brownish-gray with the wings held rooflike over the body. The wings have a large number of veins (lines) and are often mottled. The antennae are long and threadlike. Males have long, curved, sickle-shaped mandibles (jaws) approximately 1 inch in length. The females have short inconspicuous jaws. Dobsonflies are active at night and are attracted to lights. They have an awkward fluttery flight but still travel considerable distances and are occasionally found some distance from a body of water. Adults live for a brief period and do not feed. 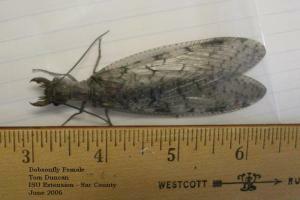 Dobsonflies found in unsuspected locations away from the river can be safely ignored. Handling dobsonflies is only somewhat risky. It is the female with the short, inconspicuous mandibles that can inflict the more painful bite if handled carelessly. No control treatments are necessary. Dobsonflies develop from underwater larvae known as hellgrammites. The larvae live for up to three years among rocks on the bottom of flowing rivers and streams where they feed on other small insects. They typically occur only in high quality, well-oxygenated water. Larvae grow up to three inches in length are dull colored and have gill filaments and feathery gill clusters along the sides of the abdomen. There are two hooks at the end of the abdomen. Hellgrammites are used occasionally as an excellent fish bait. Larvae can inflict a painful bite when mishandled.